Charl Schwartzel finished six strokes ahead of his rivals to secure his second successive European Tour victory. 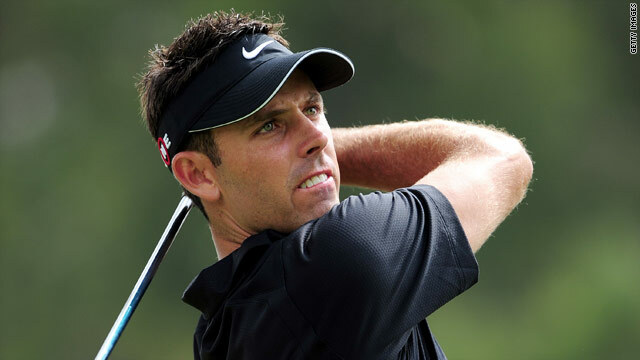 (CNN) -- South African Charl Schwartzel coasted to a second successive European Tour victory in his home city on Sunday. The 25-year-old followed his one-shot Africa Open win last weekend with a six-stroke triumph in the Joburg Open at Royal Johannesburg and Kensington. Northern Ireland's Darren Clarke, who let slip a chance to apply real pressure midway through the front nine, chipped in for eagle on the last to tie for second place with Schwartzel's compatriot Keith Horne, round in a best-of-the-day 64. The notable double, completed with a polished 66 for a 72-hole total of 261 (-23), takes Schwartzel to his best position in the world -- as high as 35th depending on what happens on the U.S. Tour. His fifth European win should also lead to him making a Masters debut at Augusta in April. The top 50 the week before the first major of the season all qualify. The margin of victory equalled the biggest of last season and Schwartzel told reporters: "It's been a fantastic two weeks for me. I played good last week and it definitely carried over. "The Masters? I'm very excited about that." He will now try to become the first player since Seve Ballesteros in 1986 to win three consecutive European Tour events, but the competition in Abu Dhabi will be a lot stiffer. The field includes eight of the world's top 14 -- last season's money list winner Lee Westwood, defending champion Paul Casey, last week's U.S. Tour winner Geoff Ogilvy, Henrik Stenson, Rory McIlroy, Ian Poulter, Sergio Garcia and Martin Kaymer.